The Midland Flood Wall is part of Drumheller’s flood protection system and prior to this project consisted of compacted clay embankments and about 350 metres (m)of a 0.6 m (2 foot) high concrete flood wall and traffic barrier. The Midland Dykes were constructed in 1991, and were designed to protect development on the north bank of the Red Deer River, between 25th Street and 12th Street for flood flows up to about 1450 m3/s. On June 21, 2005, flood flows within the Red Deer River peaked at close to the design discharge, around 1450 m3/s. Surveys showed that the original dyke design slightly underestimated water levels and that the dyke would have been over-topped, had emergency measures not been put in place by the Town of Drumheller. In co-operation with the Town of Drumheller, Alberta Transportation and Alberta Environment are raising and rehabilitating the Midland Flood wall to provide protection to 0.3 m (1 ft) above the surveyed 1450 m3/s flood level. 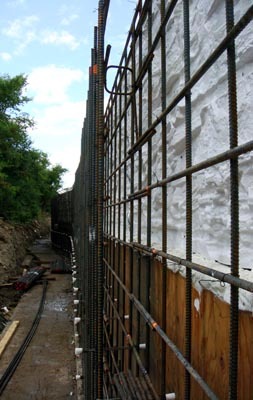 The new flood protection system is similar to the old system however, the wall was raised by about 0.65 m (2.1 ft) at the upstream end, near 25th Street, and only 0.30 m (1 ft) at the downstream end, near 12th Street. A number of alternative designs were considered to replace the concrete barrier portion. The final construction involved a cast-in-place concrete floodwall along the alignment of the old barriers. The flood wall extends about 1.5 m (5 ft) below the surface, to strengthen it and reduce seepage of water through the soil, as was observed during the 2005 flood. The new concrete wall is up to 0.6 m (2 ft) higher than the old concrete barrier. 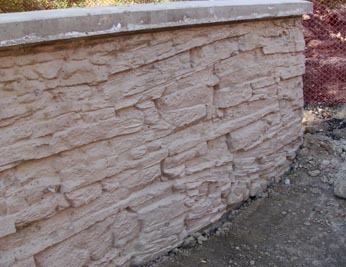 The design of the wall involved the use of a patterned form liner and coloured concrete to replicate local sandstone. In order to complete the entire project, Trevcon sub-contracted Empire FormworX to form the floodwall and place the concrete. Concrete was provided by LPR Concrete of Drumheller.